The Patient Spouse and I recently took a trip to Arkansas and saw this architectural landmark – Thorncrown Chapel – for the first time. The P. S. has loved this building since the first time it showed up in the pages of architectural magazines. It is certainly worth the visit, and we went there two days in a row. This is the view from the walk to the building; starting tomorrow I’ll post a few images from the interior. If you want more information, you can see the chapel’s website or the Wikipedia page. And, for fun, check out the 50 most extraordinary churches of the world (it’s number 49). 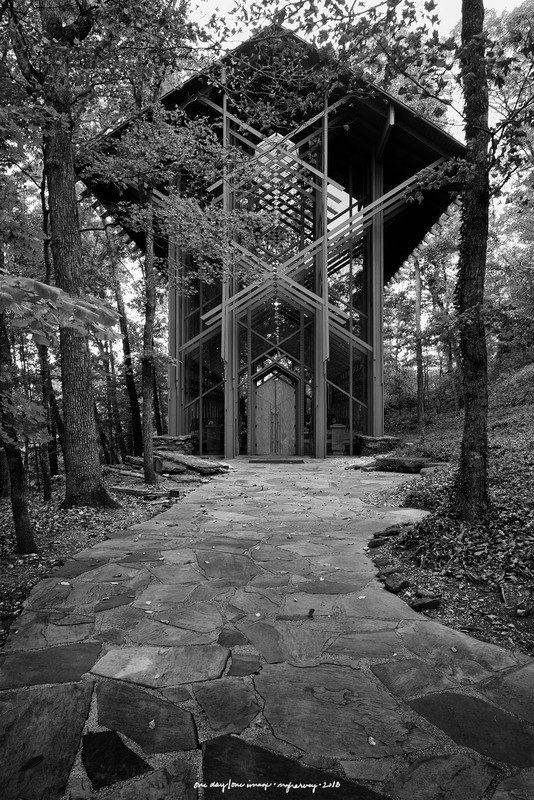 Posted on October 18, 2018, in Photography and tagged 365 photo project, architecture, Arkansas, black and white photography, Eureka Springs, Eureka Springs Arkansas, Fay Jones, learning to see, Leica, melinda green harvey, monochrome, one day one image, photo a day, photography, postaday, road trip, Thorncrown Chapel, thoughtful seeing, travel photography. Bookmark the permalink. 2 Comments. I grew up in Missouri, and I love Arkanasas. The only other time I’d ever been to Arkansas was when I was in middle school, and wasn’t paying that much attention (apparently). I didn’t know how beautiful it was around Eureka Springs – I’m ready to go back!